Thanks “Tony” for the heads up on a purported 2007 draft of The Imaginarium of Doctor Parnassus. I say “purported” because it is listed as being written by “Terry McKeown and Charles Gilliam” rather than by Terry Gilliam and Charles McKeown. And nobody has been able to either confirm or deny that it is a true draft of the script. 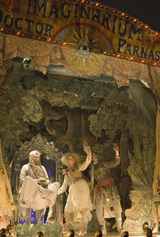 The immortal 1,000-year-old Doctor Parnassus leads a traveling theater troupe that offers audience members a chance to go beyond reality through a magical mirror in his possession. Parnassus had been able to guide the imagination of others through a deal with the Devil, who now comes to collect on the arrangement, targeting the doctor’s daughter. The troupe, joined by a mysterious outsider named Tony travel through parallel worlds to rescue the girl. Hasbro’s Major Matt Mason movie, hard driving computer industry egg heads plan a bank heist, a slow aging man has time to develop survival skills and in the WTF category – The Three Stooges movie? Things begin to change for the worst when a Postman starts to receive love letters. Read the script (12 pages pdf format). Talk about the script. Script Shack is having a March Madness Sale! Get 15% off all scripts! Check ’em out! Permalink | Comments Off on Script Shack March Madness Sale! 15% Off! Two best friends relationship put to the test, epic journey to depths of despair, doctor has a car accident and half human/half fish searching for true love. I normally don’t put up trailers or sneak peeks to a film unless I have a script for you to read, however I make an exception in this case. The script Abattoir by James McClung was written in 2005 and shortly thereafter James submitted it to SimplyScripts with the following logline. Over the next two years a dozen or so folks, including Mike Shelton, Zack, ‘The Boy Who Could Fly’, tonkatough and ‘alffy’ read and gave input on James’ script. In late 2007 James asked me to take the script down as someone was interested in producting the script. Important Note – The script was not picked up from SimplyScripts, but rather James actively shopped the script around. SimplyScripts had nothing to do with this script getting produced. Flash forward to March of 2008 and James’ cryptic discussion board posting entitled Back from Canada. Abattoir was being filmed by Kalman Szegvary of Wildfire film studios. James gave a great set report posting in the Movie Rumor board. Flash forward another year and James was able to share a small unofficial Abattoir film site that he and the director put together for a class that James is taking as a Film/Media Arts student at Temple University in Philadelphia. Below is one of two “behind the scenes looks” at the new film that you can find on the unofficial Abattoir site. The film is currently in negotiations with a distributor. Thanks Audrey for the heads up on Fade In Magazine’s Response to the recent article in The Wrap entitled Are Aspiring Writers Being Lured With Promises Fade In Can’t Keep? which I blogged about last week. …I was left scratching my head about what I wrote in my blog post that was derogatory, defamatory or libelous (I’ll wait for the lawyers to let me know) and of course felt compelled not only correct the errant link, but also to make sure you are aware and have a chance to read Fade In Magazine’s response which begins, Did a new entertainment media competitor maliciously attack Fade In and its editor in chief in order to attract readers to its new website or is there something more sinister going on besides sloppy reporting? You decide. update: For what it’s worth, MediaBistro still has their article on this up. ****instructed by who? Zorgon? The Voice in your head? *****What deragatory or derogatory statements? ******mediabistro’s article is still up. *******nope, just two dorky sites have posted about this. ********Bring it. Hollow threat. Seriously, “put my link up or I’ll sue you.” Please have your lawyer contact me. You are pathitic and whiney. Entries (RSS) and Comments (RSS) | 64 queries. 0.203 seconds.